Both AVI and MP4 are popular video formats. However, due to the large file size, AVI file is not commonly used for portable devices or video streaming sites. If you have your favorite videos in AVI format, and want to play them on iPhone, iPad or stream on the Internet, converting AVI to MP4 would be a good choice. So, is there any free way to convert AVI to MP4 or vice versa? Of course, in this post you’ll find a list of best free online video converters that allow you to convert AVI to MP4. You can weigh the features and functions, then select the one according to your requirements. 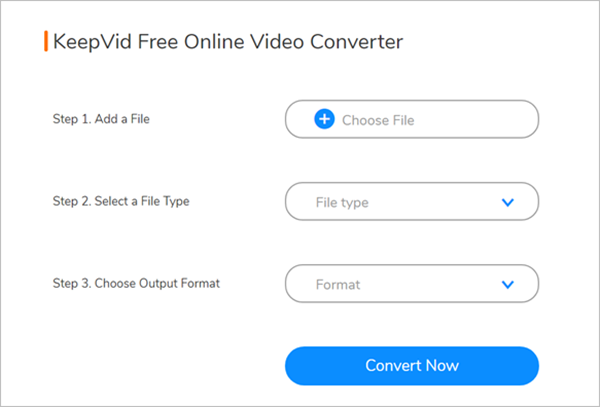 OnlineVideoConverter (OVC) is a free online media conversion tool that used by many people to convert video files between various formats, including AVI to MP4. Although it is a web based application, you can always access it as long as you’ve got internet connection irrespective of your location. With this free AVI to MP4 converter tool, you can simply upload a video file from devices or cloud storage, then convert to any format you want without the need to install additional software on your computer. This tool is extremely fast and has no restrictions on conversion and download. Online-Convert is a popular all-in-one online converter that gives users the opportunity to convert AVI files to MP4 videos. It is totally free to use and does not have a convert limitation. Supporting a wide range of input formats, this site is versatile and great in meeting your MP4 conversion needs. This AVI to MP4 converter free tool allows you to upload files from local folder, Google Drive and Dropbox etc. Besides, this website enables you to edit output settings such as cut video, rotate video, change bitrate, frame rate, etc. CloudConvert is another free online AVI to MP4 converter that used by many people. This website also allows you to upload video files from local drive, Dropbox, Box, Google Drive, One Drive, and download online medias from various video sharing sites. CloudConvert supports conversion between more than 200 file formats, ranging from video to audio, document, archive, image, spreadsheet and presentation. It is very simple to use, just upload your files and this web application will do the conversion for you. Your uploaded files are safe and will be deleted immediately when the conversion is finished. There is also another free online media converter website known as KeepVid Video Converter. The best thing about this web based converter is that it is very easy to use and helps you convert any video to MP4 files, including AVI to MP4. KeepVid Free Online Video Converter supports a wide range of video & audio file formats, and fully compatible with all modern browsers. With it, you can easily convert video and audio files to most popular file formats without any quality loss. Zamzar is considered to be one of the most popular free online video converters. If you wish to convert AVI to MP4 online, just go in for this web based application. It serves a simple and fast way to convert videos and audios between 1200+ file formats. The conversion is a four step process and therefore very easy to operate. Just upload your file, select the output format, enter your email address and then click Convert. When looking for a good free video converter online, you should also consider Apowersoft Video Converter. It is an efficient and fast video converter that allows you to convert videos to any formats at amazing fast speed. This free AVI to MP4 converter also comes with advanced editing options. You can customize your media files online before conversion, such as trim video, adjust video size, change video effects and add watermarks. This website is absolutely free to use. Any time you want to convert AVI to MP4 or other formats online, you can simply visit this site which requires no installation or any signup. Convert.Files is a free and simple online file converter that supports a wide range of file formats. It enables you to convert videos from AVI to MP4 with utmost convenience and ease. This site is free to use and capable of processing large video files up to 250MB. Convert.Files keeps your files secure and private. All uploaded video files are deleted immediately after being converted. Besides, you can download and convert videos from popular video sharing websites such as YouTube and MetaCafe etc. The above listed free online video converter can basically meet your needs for AVI to MP4 conversion. However, it might be risk to upload your private or sensitive videos to a web based application. Plus, all these tools can’t work without internet connectivity. If you need a professional video converter, we will recommend Gihosoft Free Video Converter. It is a great free alternative to online AVI to MP4 converters and does a better job than any other free video converters out there. This video converter supports almost all video and audio formats and offers basic editing tools. Also you can use it to grab videos from YouTube, Facebook, Twitter, or other video sharing sites. Download, install and run this free AVI to MP4 converter on your computer. Click the “Add Media” button on the main interface to import AVI files. You can cut, trim, crop, rotate, add effects, watermark, etc. according to your need. Then select “MP4” from the right panel to set it as the output format. Now you can simply click the “Convert” button to begin the AVI to MP4 converting process. For batch conversion, tap on “Convert All” at bottom right.